This place is strange. There are so many humans milling about. They move like a river of arms and legs and faces down long narrow caves that branch out into smaller caves. Each of these caves is filled with different things. There are several caves housing fabrics of various colors and size. There are a few caves with things that light up and make noises (the humans love these things and look at them as they walk around). There is even a cave filled with dismembered, miniature versions of me (which are quite terrifying). The humans feel the need to visit multiple caves in this place; some humans even visit every one of them. They are like ants marching through their hill. But instead of bringing food or resources to the caves within the hill to make their community better, the humans take things away from these caves. They leave carrying loads of bags and boxes filled with things they found (stole?). They chat with other humans (who are not there) on those things that light up and make noise about how they just found (stole?) a brand new version of the thing that lights up and makes noise. One human cub carries a recently reassembled version of me under her arm. She seems happy about it, until she sees the real me. Maybe I make her upset because I was not wearing a hat like the smaller version of me. I do not know if I like this place, but I am starting to think this place does not like me. Three humans with sticks yell at me. Other humans watch. It is quite humiliating. I run for the exit (or what I think is the exit) and crash into fake, faceless, humans covered in furs and strange flat snakes around their waists. I try to leave again and tumble into a small table thing for serving hot, delicious nuts. The humans behind the table are not pleased, but I do not waste the intrusive moment, and I scoop as many pawfuls of nuts into my mouth as possible. More humans with sticks show up. There are lights outside filling the massive, interconnected, human cave system with hues of blue and red. I try to exit once more. This time it is successful. I find myself outside near the dumpster that led me here in the first place. The air is better outside than inside the human cave. To think I was almost trapped in there is a very upsetting thought. Maybe all the humans milling about inside are trapped. Maybe they are being made to take things from those caves and forced to carry them around. I hope not. That would be quite sad. At least I found some nuts. That was nice. 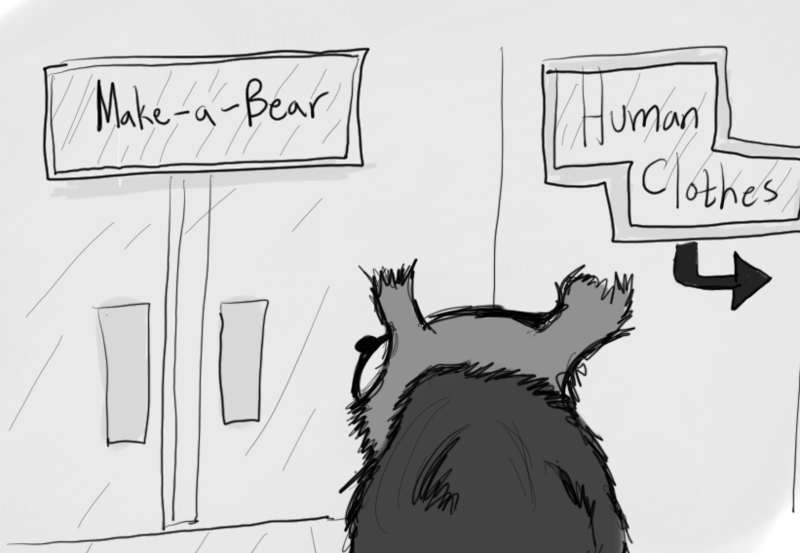 This entry was posted in Bear thoughts and tagged @a_single_bear, bears, do not throw things at me please, dumpsters, humor, nature, nuts, okay, please, the forest, the mall, trees, twitter on April 11, 2016 by A bear.